Rev. Matthew Talarico said the new roof will start going up in November and should be complete by the spring. WOODLAWN — Shrine of Christ the King will start looking again like a building this spring, two years after a fire that gutted the historic church. Over the winter, the church at 6415 S. Woodlawn Ave., will get a new roof, ending a difficult chapter for the congregation and marking the start of a new chapter to make it ready to hold Mass again. In October 2015, rags used to apply floor stain spontaneously combusted in the balcony of the church, starting a blaze that consumed the roof, interior and undid a decade of restoration work on the church. 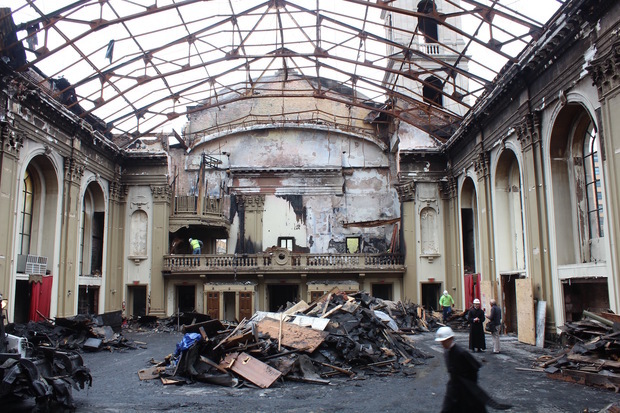 After the Archdiocese of Chicago handed over the church and saved it from demolition last year, the congregation has spent the a year raising $2.2 million, clearing out the wreckage and repairing fire-scarred walls. Talarico said the new steel roof trusses are being made now and will be installed in November with a roof going on in January. The National Fund for Sacred Spaces and the National Trust for Historic Preservation on Oct. 11 announced a $250,000 matching grant to finish the roof. 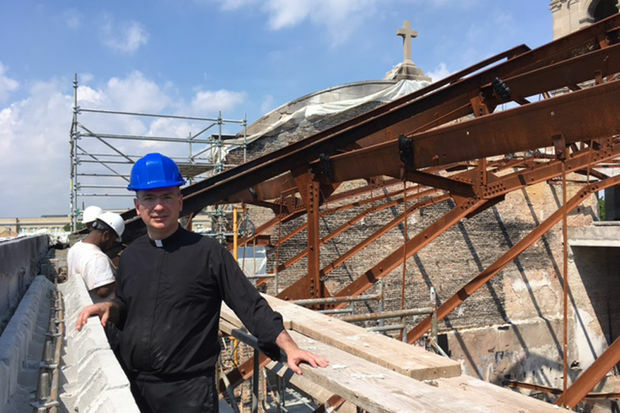 Though the roof once completed in the spring will end a long chapter in bringing the church back, it is still more than a year away from holding Mass in the building again, Talarico said. He said the church needs to find a whole new set of people who can help install the plumbing, heating and electricity that the city will require before ceremonies can be held in the building again. The fundraising and work could take a year or more, Talarico said. “It all depends on pricing, we’re still pricing it out but it could be $4 million,” Talarico said. 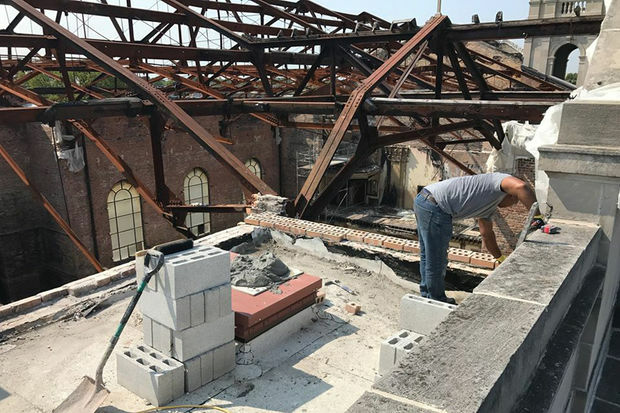 Despite the long process to even be able to go back into the building every day, Talarico said the congregation remains motivated and the preservation and Woodlawn communities are still engaged. Talarico said more than 500 people came out to see the shrine for Open House Chicago despite the poor weather. The shrine is still accepting donations, which can be made through its website.